US President Donald Trump has hosted an event at his hotel in Washington, to raise cash for his 2020 re-election campaign, according to BBC. Protesters greeted the president with cries of "Shame! "as he arrived at the $35,000 (£27,000) per person bash. 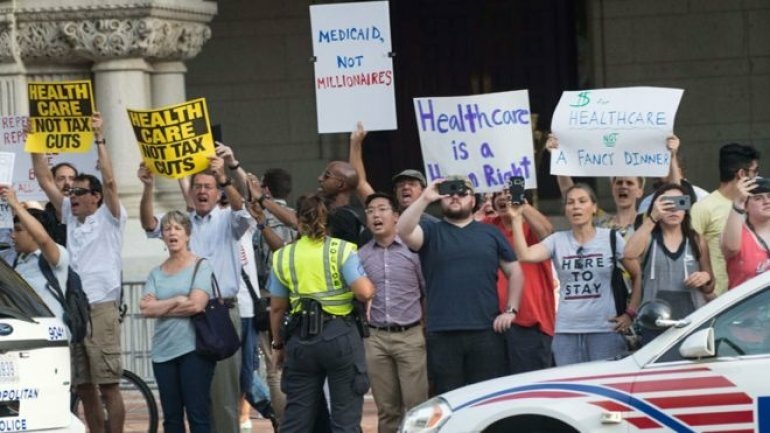 Many were unhappy with the Republican healthcare plan, holding placards that said "Healthcare, not tax cuts". Holding the fundraising event at Trump International Hotel has increased concerns about conflicts of interest. Richard Painter, who served as the chief ethics lawyer in the White House for former President George W Bush, said it was unacceptable for the president to be potentially benefiting financially from this kind of event. He should have picked another hotel, he said. But Kathleen Clark, a law professor who specialises in government ethics at Washington University in St. Louis, told USA Today it did not break any laws. It is not clear if the hotel is being paid to host the event. Republican National Committee officials were expecting to raise about $10m, with about 300 places available.